The Linksys Wireless-G Access Points can be configured as an Access Point, Access Point Client, Wireless Repeater, and Wireless Bridge. Connect the Mac to the Ethernet port located at the back of the access point. Assign a static IP address on the Mac computer. For instructions, click here. NOTE: “x” can be any number from 2-99. After assigning a static IP address on the Mac, configure the access point by following the instructions below. The Access Point mode allows wireless clients to connect to the access point and routes traffic between the wireless and wired interface. Use this mode to create a standard wireless Infrastructure network. For instructions, click here. The Access Point Client mode allows this device to act as a wireless client. 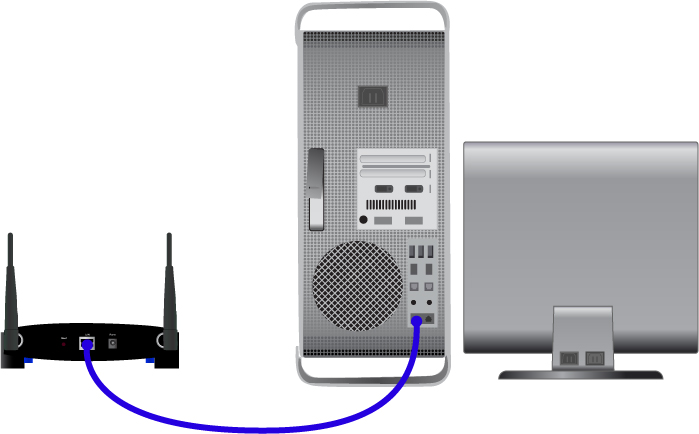 You can connect a wired PC to the access point client to connect to a wireless router or another access point wirelessly. You can enter the MAC address of the access point or use the Site Survey button to select the Access Point you want to connect. NOTE: The WAP54G will only communicate with another WAP54G when set to Access Point Client. For instructions, click here. The Wireless Repeater mode allows this device to act as a wireless repeater. A wireless repeater can extend the range of your wireless signal without sacrificing the transmit rate. Enter the wireless MAC address of the access point whose signal you would like to repeat. NOTE: The WAP54G will work as a wireless repeater with the Linksys Wireless-G Access Point (WAP54G) and the Linksys Wireless-G Router (WRT54G). For instructions, click here. The Wireless Bridge mode will turn the access point into a wireless bridge. Wireless clients will not be able to connect to the access point in this mode. Enter the wireless MAC address of the wireless access points that you would like to bridge together. NOTE: The WAP54G will only communicate with another WAP54G when set to Wireless Bridge. For instructions, click here.